|sistra| / |систра| - Revolving In You - BFW recordings netlabel - ambient shoegaze indie experimental electronica - music is free! The new EP by fantastic Russian indie band |sistra|, or more correctly, |систра|, their fifth on BFW. 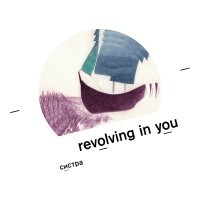 The EP consists of the original version plus five varied remixes of the song 'Revolving In You'. Remixes from Gosprom, iluvya, ifwe, There is a Light (Антон Смирнов) and Mineguide и S.Z. Spreading their music via the internet they gained some recognition among Russian independent music scene. Some singles are in rotation on several Russian radio stations across the country. Radio Maximum (Moscow) named |sistra| one of the best newcomers of Russian indie-music scene.